In some situations, encryption keys may be unavailable in the Veeam Agent for Microsoft Windows database, and Veeam Agent for Microsoft Windows cannot create a new encrypted restore point in the backup chain. For example, this may happen after you change the password for encryption and then recover the entire Veeam Agent computer to a restore point that was created before you have changed the password. In this case, information about backup in the Veeam Agent for Microsoft Windows database will become outdated and will not match backup metadata residing on the target location. To continue the existing encrypted backup chain, you need to provide the latest password in the Veeam Agent for Microsoft Windows Control Panel. To continue the existing encrypted backup chain, you can enter the password specified for encryption and click OK. If the password has changed more than once, you need to specify the latest password. 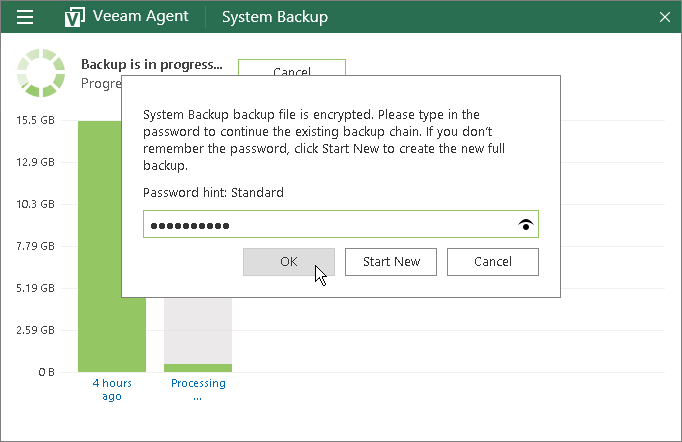 After you provide the correct password, Veeam Agent for Microsoft Windows will use this password to decrypt backup metadata on the target location and update information about backup in its database. After that, Veeam Agent for Microsoft Windows will create the new incremental backup file in the existing encrypted backup chain. To encrypt this backup file and subsequent backup files, Veeam Agent for Microsoft Windows will use the password that is kept in its database at the time when continue the backup chain. You will be able to use this password to restore data from any restore point in the backup chain, including restore points that were encrypted with an older password and restore points that were created before you have enabled the encryption option for the job. If you do not remember the password or do not want to continue the existing backup chain for some reason, you can click Start New immediately without providing a password. If the encryption option is disabled in Veeam Agent for Microsoft Windows at the time when you start a new backup chain, Veeam Agent for Microsoft Windows creates an unencrypted full backup file. Subsequent incremental backup files will be unencrypted, too. If the encryption option is enabled in Veeam Agent for Microsoft Windows at the time when you start a new backup chain, Veeam Agent for Microsoft Windows creates an encrypted full backup file. To encrypt this backup file, Veeam Agent for Microsoft Windows uses the password that exists in its database at the time when you start a new backup chain. You can click Cancel to close the notification window and cancel the job. In this case, the next time the backup job is started, Veeam Agent for Microsoft Windows will again prompt to enter the password. Veeam Agent for Microsoft Windows displays the notification window for 1 hour. If you do not choose to continue the existing backup chain, start a new backup chain or cancel the backup job, after this time period expires, Veeam Agent for Microsoft Windows will automatically close the window and cancel the job. If email notification settings are enabled for the backup job, Veeam Agent for Microsoft Windows will also send an email report informing that the job was canceled. Veeam Agent for Microsoft Windows will display this window every time the backup job is started (manually or upon schedule) until you choose to continue the existing backup chain or start a new backup chain.